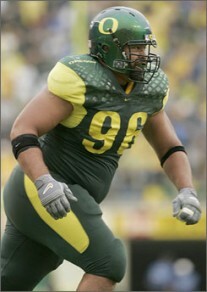 Haloti Ngata entered Oregon in 2002 as the most prolific defensive player in the history of the school, tasked with taking the program to the next level as the next generation of Oregon athletes following in the wake of the unprecedented success of the Joey Harrington-era. By the time he left in 2005, following his junior year (which included a redshirt year in 2003 after a knee injury in the first game)” he was a consensus All-American, a legendary figure in Eugene, and a first-round Draft pick of the Baltimore Ravens. While Haloti’s career shined, the team’s success on the field did not justify all that he brought to the field. A 30-18 record during Ngata’s tenure doesn’t exactly scream franchise changing as expected. The results on the field mixed, it would be easy to proclaim that the signing of the #1 overall talent in the country does not automatically result in forever altering an up-and-coming program. However the after-effects have been noticeable, a consistent uptick in recruiting experienced in the time since Ngata declared himself a Duck. On April 29, 2012, the Oregon Ducks signed Ngata version 2.0, the most physically- imposing athlete since the massive Ngata terrorized the Pac-10 and this time, the effects could be felt throughout the program. Arik Armstead, all 6-8, 280 pounds of freakish athleticism, chose the Ducks after receiving offers from almost every other program in the country. Armstead, who will also play basketball at Oregon for coach Dana Altman, is entering Oregon while the program is at an all-time high, and his presence could be the transformation that Chip Kelly has needed to etch in stone Oregon as a national powerhouse, not just the Johnny-Come-Lately in the BCS conversation. What has become evident to anyone watching a n Oregon game in the past decade is that while the offense has been spectacular and the defense fast and scrappy, the defensive line has been left behind, relying on make shift lineups of loveable role-players such as Devon Long, Brandon Bair and Taylor Hart. Oregon needs a DeAnthony Thomas-type impact on the line, someone who makes Oregon the destination spot for the big-uglies, where it is often said games are won and lost, in the trenches. When Ngata came in 2002, Oregon was fresh off the Fiesta Bowl win over Colorado, and a sparkling #2 finish in all polls, but it was still far from being thought of as a major player in College Football. For all of the havoc that Ngata wrought on opposing offenses (and hopefully Armstead will bring), there seems to be something else that they share in common; They’re big teddy bears off the field. Ngata, who has a child with wife Christina, says having children changed his life–and the way he plays the game–forever. He now plays for his teammates more than himself, and if he can clog the gap and allow his linebackers to get a cleaner look, then he will do it. Armstead, cut from the same mold physically, seems to share the same characteristics and mentality. Armstead seems to have a quiet confidence about him, but it’s controlled. Ngata came from a Mormon background, and he has a good head on his shoulders. He works with the Juvenile Diabetes Research Foundation (JDRF) after his mother, Olga, died from Diabetic complications in 2006 while Ngata was at the UofO. Ngata credits his cool demeanor off the field for the incredible talent and motor on it. According to the Oregon coaching staff, Armstead only needs to be told how to do something one time, and he has it down, he took in coach’s advice, and then immediately put their lessons into action. Does that sound familiar? It should, since it’s the same thing we heard last year about DeAnthony Thomas. He turned out to be pretty good, right? It’s similar to what has been said about Marcus Mariota. If Armstead as a true freshman can understand his responsibilities and play with confidence, thus allowing his natural skills to take over, then Oregon will be seeing something special, another instant impact player like DeAnthony Thomas last year, and Ngata in 2002. The downfall of being so hyped at only 18 years of age, not much is yet known in the public about Armstead the individual beyond his on-field achievements, but if he is as mentally strong and in character as he already is from a physical standpoint then Oregon will have found something special. Oregon has the offense. 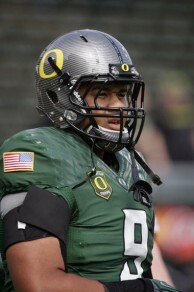 They now have the defense to go along with it, whether or not Oregon experiences an instant impact from Armstead. If he can live up to the hype though, it could send the ducks into the next stage of college football, though following in the wake of a Rose Bowl championship and a trip to the national championship the year prior, there is not much higher that the program can possibly climb. Oregon has won 34 of its 40 games under Chip Kelly. The program, once thought of as Nike’s shiny toy, has thrust itself into the spotlight for its play on the field more than its antics off it. Heading into the season opener against Arkansas State, expectations are as high as ever. Arik Armstead entered spring ball as the highest-rated defensive recruit since Ngata, and did not disappoint one bit. What Armstead does on the field will be vital, but how he carries himself off the field may be even more important for the future of the program with the expectations of being an ambassador for the future of Oregon football. It is difficult not to draw parallels between Ngata and Armstead, the two highest rated defensive players to ever enter Oregon. Both players entered their careers at Oregon following wildly successful eras(Ngata came in after Joey Harrington, Armstead enters post LaMichael James). Ngata has come and gone, and now its Armstead’s time. It seemed fitting that Haloti Ngata was seen standing on the sideline during the spring game, being interviewed while Armstead made a spectacular play, plowing over Hamani Stevens and causing a fumble by Marcus Mariota. Coincidence, or a sign that something big is coming? Ngata was spectacular, his towering presence a void that has never truly been filled since his early departure. Armstead’s time is now. Offensive skill players are flocking to Eugene at a record rate, and there seems to be no sign of Oregon’s ability to recruit elite athletes slowing down. Armstead has been the lone missing piece in achieving the ultimate goal, an overpowering defensive line. A dominating career by the baby-faced defensive end could make it cool for game-changing D-line prospects to come to Oregon. Then–and only then–will Oregon be able to stand toe-to-toe with the traditional SEC powers known for great defensive lines. It remains pure speculation as to if Armstead’s presence will inevitably lead to Oregon’s first BCS national championship, however the aftershock of his decision to come to Eugene could be the final piece needed to complete the puzzle. From all accounts, he’s a great kid with a mean streak on the field. If Armstead has a Ngata-type career on the field, Oregon will reap the benefits for years to come, because now recruits–and the rest of the country–are watching.